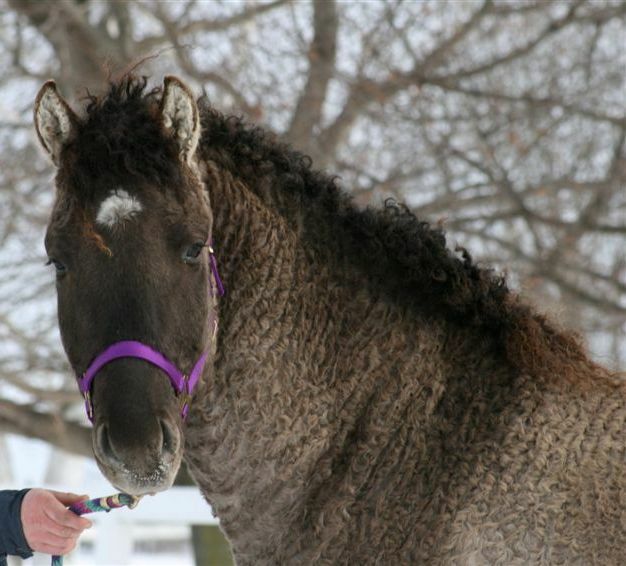 The Curly is a breed of horse that is known to be hypo-allergenic. 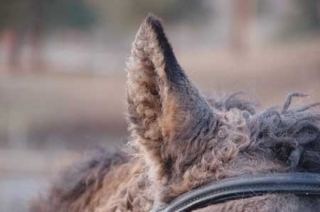 Recent studies have concluded that the Curly Horse is hypo-allergenic which means that people with allergies will have little to no reaction to them – a dream come true for allergic horse lovers giving them the chance to pursue their love of horses!!!!!!! The unique gene that gives Curlies their curly hair (which is most obvious with their winter coat), can be expressed in a few different ways. (This can only occur in a purebred Curly, not crossbred). The coat in summer shows a slight wave in it, but not as extreme as the winter curls. Because the trait can be carried heterozygously, some purebred Curlies exhibit no curl at all (called “smooth coat” Curlies). Curlies have split manes and care for the curly hair is simple. Most people choose to not comb the mane because the hair will lose some of its curliness. The manes are often trimmed to keep them from matting or you can rub certain oils through it with your fingers. The tails can be combed. Some people choose to collect the hair that is shed from the mane and tails in the spring as it is compared to mohair and can be spun. Most people allergic to horses can handle the Curly Horse without suffering any to very little allergic reaction – dependent on the fact that they are not running with a regular horse. Research indicates a protein is missing from the coat of the Curlies which may be what causes the allergic reactions to horses in allergy sufferers, but the study has never been officially published. Though eye catching and unusual in the show ring, Curlies have the movement, endurance and heart to excel in competition. Curlies have been shown at upper levels of dressage and show jumping, cutting and reining, endurance and others have proved to be a reliable mount and patient teacher for the weekend competitor. Curlies are characteristically quiet, level headed horses that make excellent first horses for supervised beginner riders. Curlies have carried horse-allergenic riders from beginner status through to more advanced stages of riding. Curlies seem to be versatile no matter what your discipline, Trail, Western, English or Show. They are truly a wonderful breed and offer great variety. GET A BIT OF CURL IN YOUR WORLD – YOU’LL LOVE IT !!! !